Those who have used Twitter are familiar with the @ lingo: When you put @username (e.g. @LeeAase, @MayoClinic, @MeredithGould) in a tweet, you are replying to or mentioning that Twitter user in the public space. Facebook developed similar functionality several months ago, but I have to confess I haven’t used it as much or as well as I should. Hearing my friend Alan De Keyrel mention the @ tag in Facebook as a key strategy for building connections caused me to take a more in-depth look. I think it’s definitely something people in charge of maintaining Facebook pages for an organization should be exploring and using. some cautions on what to avoid. The @ tag is essentially like tagging an individual in a photo, but it goes beyond that. 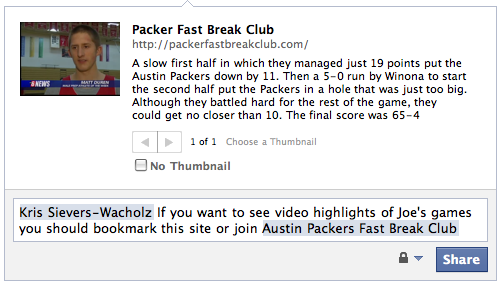 It’s a great way to share content with your friends and with their friends. Mainly, don’t think like an advertiser. Advertisers look for ways to interrupt people and push their messages, whether the recipient wants them or not. 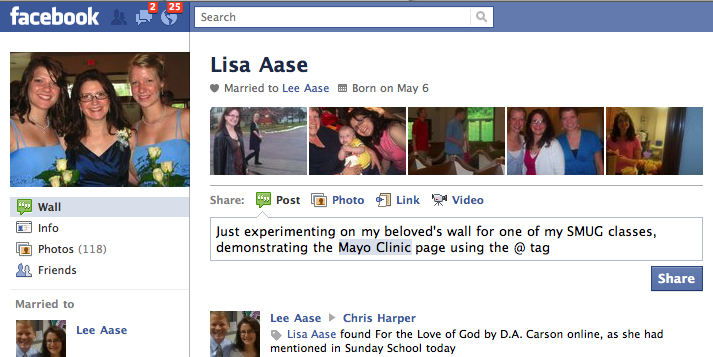 In my first example above, I did post something to Lisa’s wall that may not have been all that interesting to her, although I did refer to her as my beloved. She understands when I need to experiment. Part of the price of being married to the Chancellor. In the second post, though, I was sharing something with my sister-in-law about her nephew’s basketball team. I had every reason to expect she would find it interesting and welcome. The side benefit is that some of her friends, such as other family members, will see this on her wall and may also like it. 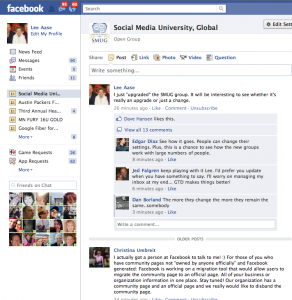 They may also decide to join the Facebook group or subscribe to the blog. If I just started randomly tagging other friends in the post, that would have been a quick way to lose friends and not influence people. The same is true for your use of @ tags relating to your organization’s page. It’s one thing if your friends or page connections decide to tag your page on their profiles, or tag their friends in a post or status update. 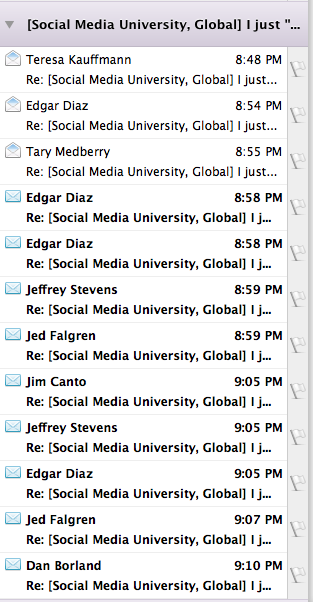 It’s completely different when you use the @ tag to spam pages or profiles. Think like a real person. If you’re using the @ tag mainly to drive traffic and not to connect people to information that will be interesting to them, your effort will not be successful in the long run. But used wisely and with integrity, the @ tag can play a significant role in helping you make connections with people who share your concerns and convictions. Groups enable Facebook’s 400 million monthly active users to congregate and interact in discussions related to a subject, even if they aren’t “friends” with all (or even any) of the other members. 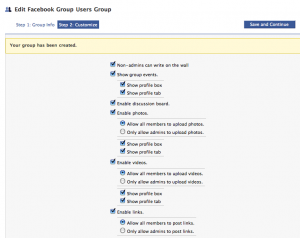 Groups in Facebook are different from Pages and even personal Profiles. Profiles are for individuals…for real people. These are the basic user accounts everyone from students to grandparents create. 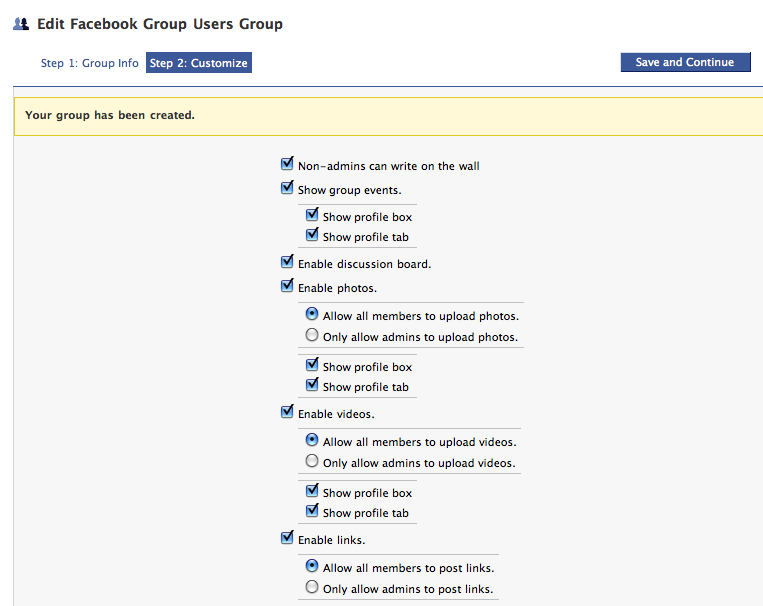 You cannot create a Group unless you have first joined Facebook by creating your personal profile. Pages are for organizations, or brands. 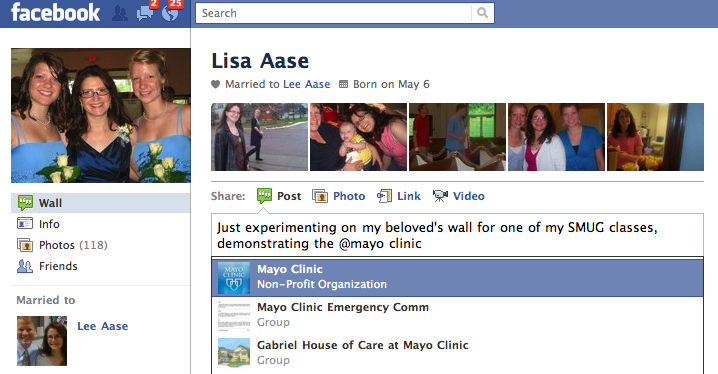 In our Mayo Clinic context, we have one Facebook “fan” page. 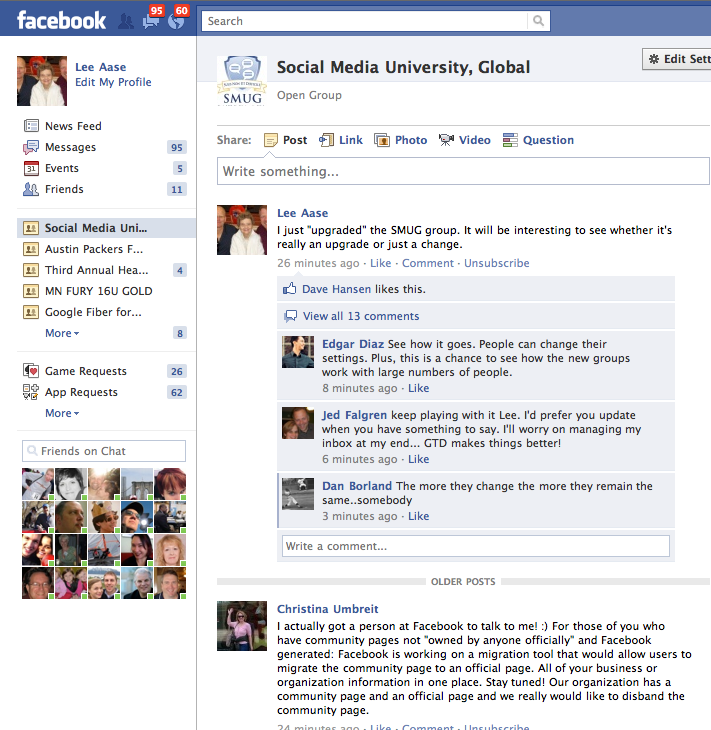 Groups are the means to create connections among people with common interests, and are the way to create communities in Facebook. 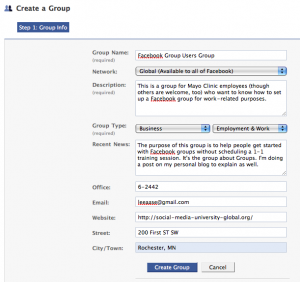 The rest of this post will take you through the process of creating a Facebook group. 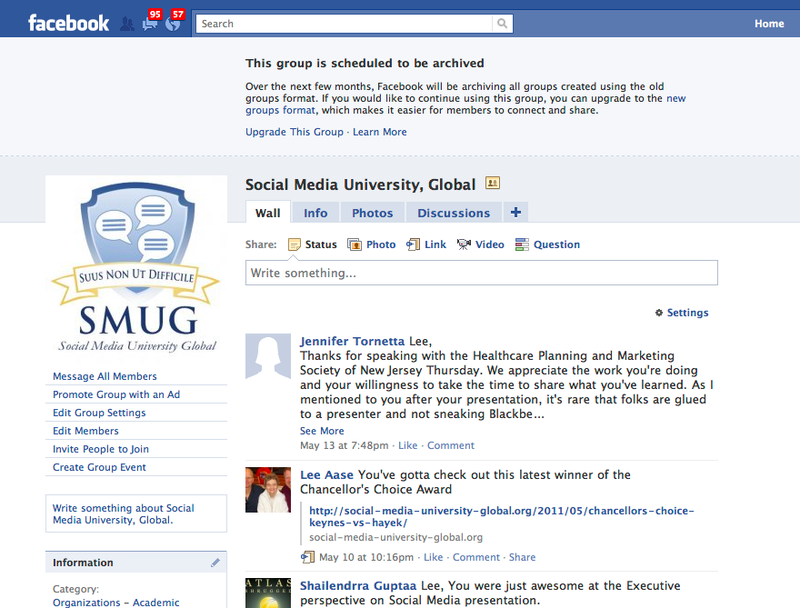 I established the Facebook Group Users Group as a way for people to get guidance on setting up Facebook groups. Please feel free to join it. 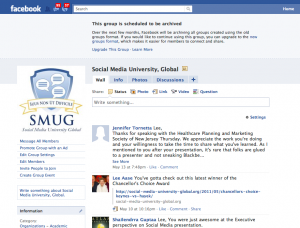 In a moment, I will take you step-by-step through the process of setting up a group, using the Facebook Group Users Group as an example. Should it be limited to one of your networks, or open to all of Facebook? 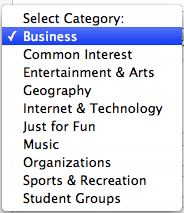 This is a different question than the Open/Closed/Secret one below. 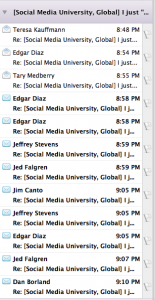 If you limit the group to only the Mayo Clinic College of Medicine network, for instance, only people with a Mayo.edu email address will be able to join. 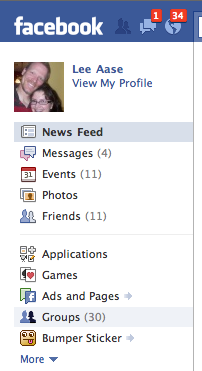 Once you decide, you can’t change your mind, so I generally recommend making it open to all of Facebook. 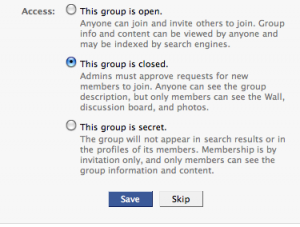 You can still limit access by making the group Closed or Secret, but once you’ve chosen to limit to a network you can’t later make it more open. Should it be Open, Closed or Secret? An Open group is the easiest to administer, because anyone can join it without being invited or getting approval from a group administrator. If you want to build a group quickly and if confidentiality of information shared isn’t a concern, open is the way to go. Anyone can see basic information about a Closed group (and can request to join), but wall posts, discussions and photos are limited to members. 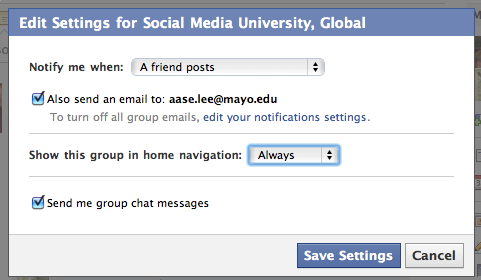 Group creators or administrators can invite their Facebook friends to join. If you have some need to limit access to the conversations and group membership, Closed is a good option. 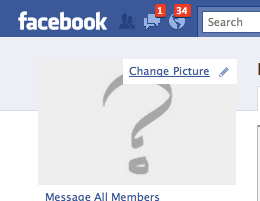 As administrator, you will get a Facebook message whenever someone requests to join, which you can approve or deny. One short-term option you can use is to start the group as Open or Closed, and then once everyone has joined you can switch it to Secret. Note: Click any of the images below to see a larger version. Then at the top of the page you will see a button that says “Create a Group.” Click it. 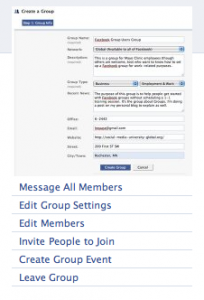 This will bring you to the first page of group set-up, for which I have inserted below the screen shot of the settings I used for the Facebook Group Users Group. Except in unusual circumstances, you will want to make the group “Global (Available to all of Facebook) under the Network setting. You can still manage who is allowed to be a member of the group via the Closed or Secret settings in the next step, but once you limit to a particular network you are forever barring people outside of that network from joining. If, however, you want a group to only be available to members from your workplace (or school), you could limit to one of your networks. But once you decide that, you can’t change it. Choose a meaningful title and add a good description of the group. This will make it more likely that if friends of your group members see the group, they will find it interesting and decide to join. 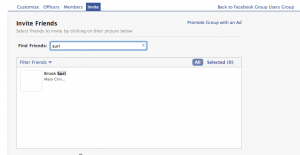 When you click the “Create Group” button on the bottom of the first page, you will go to a second page that enables you to set options for who is able to post to the group’s Wall, or upload photos and videos. Unless you have a specific reason to be more exclusive, I recommend enabling anyone who is a member of the group to write on the wall and upload photos and video. The goal is interaction, after all. In Step 3, you get to invite your friends to join the group. Just start typing their names (or you also can invite an entire friend list), and when their names show up you can click on their picture to select them. After you have selected all those you would like to invite (and added any message describing the group and why you invited them), you can send the invitations and go back to the front of the Group. From there, you can upload a picture to represent the group, as you see below. 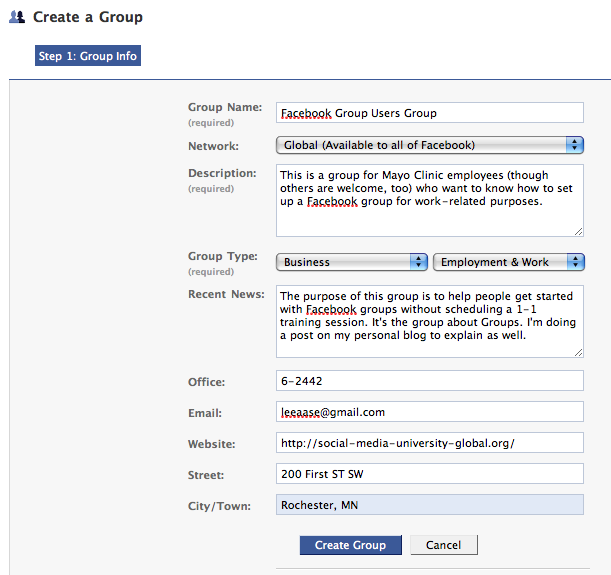 It’s a pretty straightforward interface; I decided for the Facebook Group Users Group to upload a screen shot of the first step in creating a group. The picture you choose should be meaningful for your group. 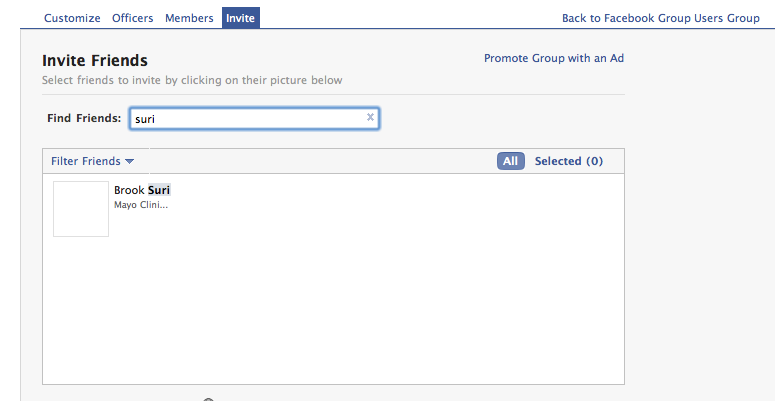 That’s really all there is to creating a group in Facebook. In a separate post, I will highlight some of the basic interaction steps within a group, and how you can further customize it to be most useful.